Melt 2 tablespoons Country Crock® Spread in 10-inch nonstick skillet over medium heat and cook garlic, stirring frequently, 1 minute. Stir in green beans and heat through, about 2 minutes. Turn into 1-1/2-quart shallow casserole; set aside. 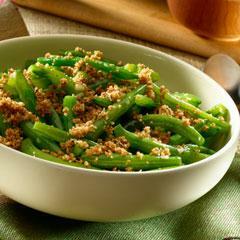 Combine remaining 2 tablespoons Spread, melted, bread crumbs and cheese in small bowl, then sprinkle over green beans. Broil until golden, about 1 minute. TIP: Use cooked fresh or frozen cut green beans instead of canned. See Nutrition Information for sodium content content.